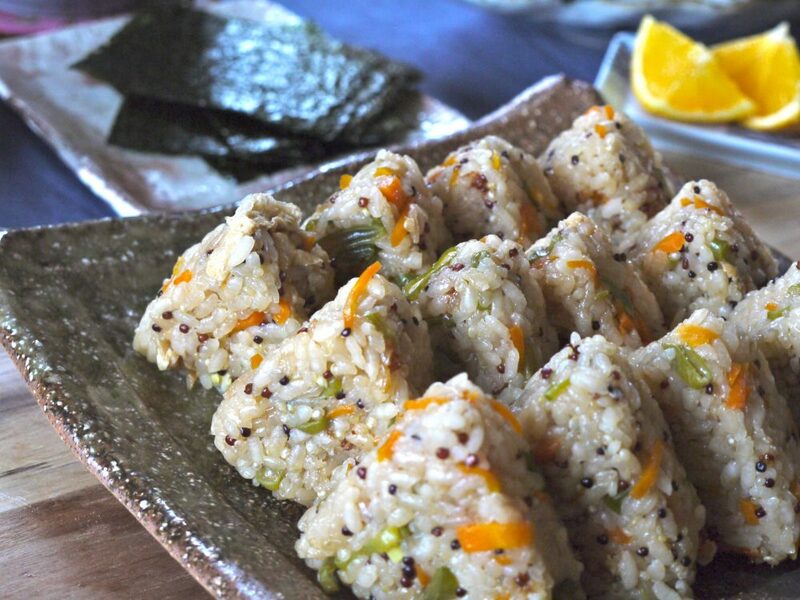 Rice is an important ingredient for Japanese cuisine, and there are many different rice based recipes. We normally eat just cooked plain rice with other meals. “Takikomi gohan” is already flavoured and cooked with other seasonal ingredients, which could be vegetables, meat, fish, mushrooms, etc. This recipe doesn’t use any meat or fish, and is suitable for vegetarians. Some recipes without meat or fish do not have a deep flavour, therefore I use “aburaage (deep fried thin tofu)” to give this deep flavour to “takikomi gohan”. Please add or change these ingredients and make your seasonal favourite “takikomi gohan” based on my recipe. Soak the dry shiitake mushroom in about one cup of water at room temperature water, and leave it overnight. Pre-rinse the rice with cold, clean water, and drain the water immediately. Swish the wet rice with your fingers gently but quickly about 10 times. Add more water, swish and rinse again. Repeat 3/4 times, then drain the water. Do NOT swish in a colander, it makes the rice grains break. Pour the rice, water, and the water from soaking the dried shiitake mushrooms, soy sauce, mirin, sake, and salt into a casserole. Soak for 30 minutes (in winter 1h). While the rice is soaking, cut the ingredients. Peel the carrot and cut it into long thin slices. Slice the mushroom. Trim the snow peas and thinly slice. Prepare the aburaage. Bring water to the boil in a small pan. Put the aburaage into the boiled water for one minute. Take it out of the boiled water, then cut into small pieces (about 3cm x 5mm). Put the all ingredients (carrot, dried mushroom, mushrooms, snow peas) into the same casserole as the soaking rice. Put a fitted lid on, then bring to the boil on a high medium heat. Once boiling, cook for 1-2 minutes, then reduce the heat to low, and cook for about 10-12mins. While cooking, please listen to the sound carefully! When all the water is absorbed by the rice, the sound stops and there is no water bubbling on the surface. Turn off the heat, add the sliced snow peas, then leave for 15mins (essential). Stir gently. Now it's ready to be served. < Rice cooker method > If you cook "Takikomi gohan" with a rice cooker, the preparation is same, and just follow the machine instruction for cooking.